Health Canada has updated the online information it provides to Canadians about the risks of asbestos, conceding that exposure to the substance in any form is dangerous. The HealthyCanadians.gc.ca website now says that any amount of asbestos inhalation can lead to "cancer and other diseases." The website used to state that asbestos can cause lung scarring when inhaled in "significant quantities," and that the risk depended on how often and how long someone was exposed. Paul Demers, the director of the University of Toronto’s Occupational Cancer Research Centre, applauded the decision. “I think it’s a very positive move by Health Canada, recognizing that all forms of asbestos cause cancer (and) lung disease,” Demers told CTV News Channel on Thursday. The website also no longer states that chrysotile -- the type of asbestos mined in Canada for decades – does less health damage than other types. Describing chrysotile as being safer than other types of asbestos was a danger to public health, Demers said. The Canadian Public Health Association said it welcomed Health Canada's revised position. 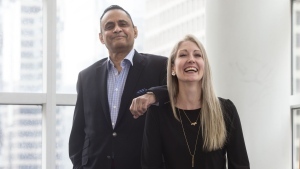 "We are relieved that Canada is beginning to fulfill its moral obligation, by recognizing the well-grounded evidence, to publicly acknowledge that breathing in asbestos fibres can cause cancer and other diseases. The Government of Canada has made a good 'public health' decision," Ian Culbert, CPHA’s executive director, said in a statement. The changes come more than two years after the federal government announced it would no longer oppose international efforts to list chrysotile as a hazardous material. While that was seen as a landmark decision, since 2012, Health Canada's website had not changed or been updated to note the government's new position. The contentious lines have now been expunged from the website, reflecting the position held by medical bodies around the world that there is no safe amount of asbestos ingestion. For years, Canada was criticized for its continued support of Quebec’s asbestos mining industry, even as the rest of the Western world banned the production and export of the mineral. Many called Canada hypocritical for banning asbestos at home, but continuing to export it to developing countries, such as India, where asbestos regulations are lax. Asbestos was once used widely as insulation and fireproofing in buildings and homes. The mineral was also used to strengthen materials and make them fire-resistant. But its fibres can be easily inhaled and carried into the lower regions of the lung where they can cause a scarring condition called asbestosis, and increase the risk of lung cancer and mesothelioma. The World Health Organization says that all types of asbestos can cause lung and throat cancers, and that approximately 125 million people are still exposed to the mineral in the workplace. As well, it says an estimated 107,000 people die each year globally from asbestos-related disease. 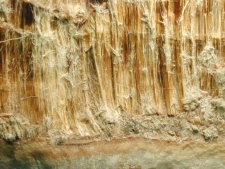 Asbestos is seen in this file photo.